This Lilypad LiPower is pretty cool. It’s basic role is to convert a 3.5v Lythium Polimer battery to 5v for Powering an Arduino micro-controller. That is done with the + and – pins in the bottom half of my photo. 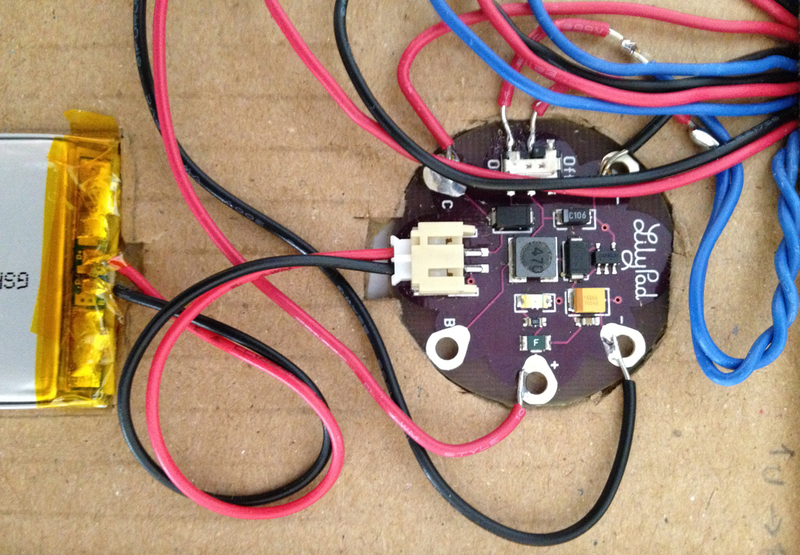 Additionally it has a connection for charging the battery without disconnecting it or removing it from the project. That is done with the (partially obscured) c and – pins toward the top of my photo. Also toward the top is a switch that turns the power to the Arduino on and off. The battery charges regardless of this switches position. This LiPower is inside the project I am working on, so I’ve added an external switch (SPST) by connecting it to two of the pins of the on-board switch. So far this set-up is working fine. I can plug a charger externally and switch the Arduino’s power while the battery is charging or not. UPDATE: Since writing this, I have added a connection between the B pin on the Lipower board to an analog pin on the Arduino. By doing this I can now read the voltage of the battery and light a warning LED when it gets low. I found that the Lipower outputs 5v until the battery voltage drops below about 2.9v. At that point the Lipower switches things off to protect the battery. This entry was posted in projects and tagged arduino. Bookmark the permalink.